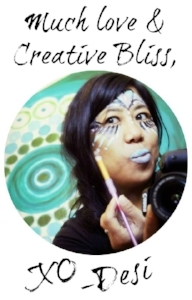 Simply put, what started as an art, travel and photography blog from the studio of Desirée East has grown into a platform to share the inspirational work of other creative minds and cultural INFLUENCERS and to share her colorful world as a creativity coach. Desirée's life style, work ethic, and approach to influencing those around her creatively, is eclectic in that she is constantly inspired by an endless combination of elements from a variety of sources: nature, music, art, culture, dance, photography, surf, travel, and of course, the beautiful people who surround her in her daily life. Desirée resides on the coast of California with her loving, supporting husband, Brendon and their beach baby, Kirra. Born a water baby in the tropic waters of Hawaii, I am a surf addict, photo junkie and dancing fool – and I love the thrill of taking off in an airplane and exploring places I’ve never been. It all began with 'following the Joneses', as my wise grandmother once warned me when I was a teenager (seriously, she was the wisest of the wise, folks). And I never really understood what she meant, until (I'll give you one big guess) I grew up and started following the Joneses. It’s 2008, and the economy is busting at its seams. Life was good. So good, that the day-to-day grind of the small bustling Landscape & Design business my husband and I owned, didn’t even phase me. Then, the Great Recession of 2009 hit and the housing market crashed, along with our micro niche business, which was directly tied to the housing market. Or, I should say, like an anchor tied to a sinking ship. A very big, BIG ship. With lots of holes. And zero life jackets. As I was busting my tail off, trying to keep afloat, I knew there had to be a better way. In that moment of survival mode - amongst the fear, the doubts, and endless nights of worrying, I realized I had a choice. That I could still create any life that I wanted, and instead of choosing to be a victim of unfortunate events, I chose FREEDOM. Like a blank canvas, I discovered that re-connecting with my creative wisdom and intuition on a soulful level would allow me to re-create a life with endless possibilities. I used art-making as a vehicle for healing and tapped into the deepest recesses of my creative mind and heart and used that creative source as a modality to find smart, do-able solutions to a grim situation. I’d taken my approach as an ARTIST and applied the CREATIVE PROCESS to my life. From atop of the ancient grounds of Machu Picchu to the temple-lined beaches of Bali, I’ve been painting a beautiful scenery ever since. It wasn't easy. And it didn't happen overnight. I had to let go of some things in life that were no longer serving me, in order to create the life I truly desired. With a fresh palette and new outlook on life, my lovely husband and I are back on our feet, and business is boomin’. I was eventually featured alongside the likes of AJ Leon (minimalist and founder of Misfit, Inc.), Chris Brogan (New York Times bestselling author), Rachel Elnaugh (BBC Dragon's Den investor), Mitch Joel (Media Visionary and recipient of the prestigious Canada's Top 40 Under 40 award), Kate Northrup (Author of Money: A Love Story), and many other inspiring thought-leaders in Author, Matthew Turner's book, The Successful Mistake: How 163 of The World's Greatest Entrepreneurs Transform Failure Into Success. After 2 decades of believing that my husband and I would never be able to have children, and at the turn of my 40th year on this beautiful planet (where I questioned my purpose as a naturally nurturing soul who would never have children and 'being okay with that'), the cosmos surprised us with an little beach angel, named Kirra. There is so much to share about this story, and quite honestly, to this day, I am still processing how it could ever be possible. But, I do believe that it was due to a combination of deep emotional healing, uncompromising self-love and acceptance, and a meaningful spiritual practice combined with creative rituals. I’m forever grateful and deeply humbled for the many blessings in my life, however big or small, and I’d love nothing more than to guide you in aligning to your deepest desires. From my early days of exploring Mother Nature with children + adults as a naturalist, to teaching art to young, brilliant souls, and creating gorgeous outdoor living spaces for high-end landscape designs, connecting with the world around me as a CREATIVE CATALYST has always been my work. It’s what lights me up. As a creativity coach and soulful adventurer of life, I invite YOU to live the most creatively blissful life you’ve always dreamed. Are you ready to live the most brilliantly FULLY EXPRESSED life NOW? Then you, my soul sister, are ready for some CREATIVE SOUL WORK. Loving all things to do with art, nature, and everything beautiful (including the remarkable people who surround me), and as I mature through the years as an artist of life, wisdom has taught me that sharing my passion for creativity empowers others to tap into a world of creative thinking that promotes self-growth within their own hearts, minds, and souls. I'd like to explore and share the endless sources of inspiration, from this wide world we live, with you. I welcome you to join me in this journey. Psssst...click here to view some fun random facts about me.